Most students, especially adult students, make at least a pretense of civility in the classroom, even if they don’t feel it. The least enthusiastic students usually come into class, take out their materials, and participate even if they make it clear that the respect for the learning process is mainly for show for the purposes of getting a grade. 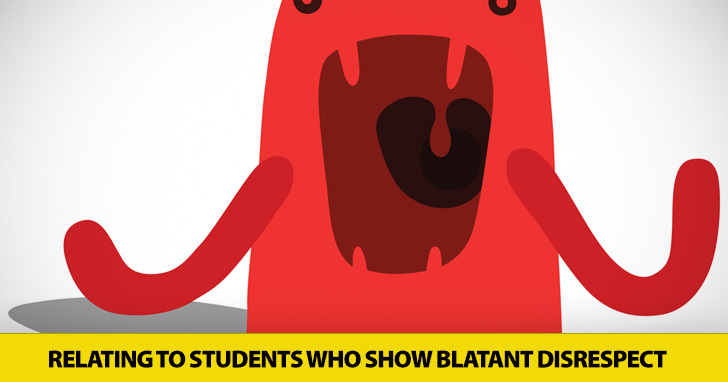 Of course they generally are not “favorite” students. However, the teacher will usually make an effort to engage these students even if they are met with continued failure. Attempting to address the needs of these disengaged students is discouraging. However, even more difficult, and for whom mere disengagement would be welcome progress, is the student who is blatantly disrespectful to the teacher, the class at large, and the learning process. This is the student who will slam down her books at the beginning of class and announce “This class ####%!$ stinks!” The situation may seem hopeless, but there are methods to rise to the challenge of dealing with this type of student. The first step is to step back from the hostile student and not immediately react. Sometimes “don’t just do something, stand there” is best. The student is, in my experience, not mostly or even at all really upset about the class but rather something else. Most effective is to quietly ask the student to calm down and to speak to you later. This itself can end the behavior. It can be liberating to think “Oh, the student is showing X behavior.” The problem is the just the behavior, not the person, and behavior can be addressed. It is also liberating to know that it is not the class or the teacher but the behavior that is the problem. Contrary to popular belief, sometimes a problem does go away if ignored. Ignoring negative behavior is called in education “extinguishing.” The problem is extinguished if ignored because the student is seeking some kind of response in acting out. If the student doesn’t succeed in getting a response, the negative behavior is “extinguished” or dies out for want of nourishment. To continue the metaphor, to pay undue attention to disrespect can actually be “fanning the flames.” Also contrary to popular belief, continued attention to a problem can even escalate tensions. “What’s the matter—no tell me, really, what’s the matter?” can be so intrusive and annoying that the student who was on the verge of ending negative behavior decides, in desperation need to stop analyzing it, to shift the attention by acting out again. In addition, often even adult students don’t really know consciously what motivates their behavior, and the classroom is not the place to get to the bottom of the cause but only affect the desired change to more appropriate behavior. The decision to disengage and ignore negative behavior may fail. At this point it’s time to respond. However, the response should still communicate that you are in control, by repeating to the student to stop the behavior and stating the consequences if she does not. Limit the discussion, again, to the desired behavioral change. Straying too much from the topic to other issues—the homework that truly sucked, other classes and students, the student’s general outlook on life, etc.—just shifts the focus and creates a distraction from the main issue. Have a “conference.” If responding to the negative behavior within the classroom is not working, then it is time to pull the student into a private conference. The behavior should be described factually and objectively. Student’s input to the causes and what he or she should do about the behavior should be addressed. Consequences for not improving disrespectful/hostile behavior can again be addressed. I usually avoid this, as unpopular as it may be, addressing notions of “special needs,” unless the student has some true disability. Certainly we all have special needs, but if we are all special in a classroom, this presents huge challenges to keeping to any consistent curriculum and assessment, creates a sense of entitlement among students, and potential inequalities and unfairness in assessment. In addition, students, by their nature, are not specialists in a field necessarily qualified to give helpful input into design of curriculum and instruction. Finally, there are standard departmental and state standards to meet within the classroom that limit any “specialness.” There are cases that are so extraordinary, however, that they should be treated as “special.” One case may be the hostile student, with whom it may appropriate to discuss individual goals, why she is taking the class, what her educational and career goals are, and so forth. Taking a personal interest in him may lessen or extinguish his hostility and will give the instructor some information about learning needs. Again, I don’t think students who display shabby behavior should be rewarded by lavishing special attention on them, but sometimes it is necessary and can be a successful strategy if the special attention you are showing is connected back to the desired change. Dealing with hostile students is among the most challenging problems of the classroom. There are some strategies that can lead to success in addressing this challenge, with increasingly heightened intervention, moving from ignoring the behavior to finally meeting with the student individually. If these steps are taken, somewhere along the way the aggressive student might begin cooperating and even engaging with the class. What are your methods to deal with hostile students?